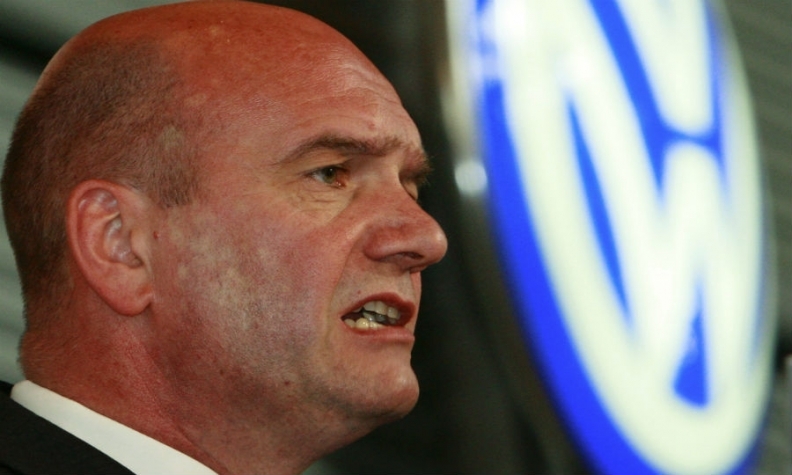 VW labor boss Osterloh called on the U.S. authorities to consider the risk of possible job cuts in deciding on penalties. WOLFSBURG (Reuters) -- Volkswagen may have to cut jobs in the United States as well as Europe and other countries depending on how big a fine the company has to pay for its manipulation of diesel emissions tests, the automaker's top labor official told a meeting of 20,000 workers at its headquarters here. The U.S. Justice Department has sued VW for up to $46 billion for breaching environmental laws, while there is still no fix for nearly 600,000 cars affected in the United States almost six months after the scandal broke. The extent to which VW may be forced to cut jobs to help meet the costs of the scandal depends "decisively" on the level of fines, VW's works councils chairman Bernd Osterloh said on Tuesday at the meeting that was also attended by the carmaker's top managers. "Should the future viability of Volkswagen be endangered by an unprecedented financial penalty, this will have dramatic social consequences," said Osterloh, who also sits on VW's 20-member supervisory board. Osterloh called on the U.S. authorities to consider the risk of possible job cuts in deciding on penalties. "We very much hope that the U.S. authorities also have an eye for this social and employment-political dimension," he said. VW employs over 600,000 people at around 120 factories worldwide, including 270,000 in Germany. Its U.S. plant in Chattanooga, Tennnessee, employs about 2,200 people. Speaking at the meeting VW CEO Matthias Mueller said the scandal would inflict "substantial and painful" financial damage on the carmaker, without elaborating. Volkswagen last year set aside 6.7 billion euros ($7.39 billion) to cover the expected costs of recalling of about 11 million diesel vehicles globally. The amount does not include the costs of fines, lawsuits and compensation that analysts say will run into tens of billions. VW has postponed the release of its 2015 results by more than a month until April 28 to better assess the financial implications of the crisis. "The software manipulations and its consequences will keep us busy for a long time," Mueller said on Tuesday, adding that it would take years to determine the full extent of the financial impact of the scandal. The German state of Lower Saxony, VW's second-largest shareholder, expects more "unpleasant news" to emerge over the months ahead but remains confident that the company has the financial strength to cope. "We will this year probably every now and then be confronted with unpleasant news related to 'Dieselgate,'" Stephan Weil, prime minister of Lower Saxony, told the meeting. "The damage will, on balance, not be minor, that much can already be said today, but Volkswagen luckily has a strong economic base," said Weil, who is a member of VW's supervisory board. Lower Saxony, which holds 20 percent of VW's common shares, has "no reason" to alter its commitment to the carmaker despite the crisis, said Weil, a member of Chancellor Angela Merkel's Social Democrat coalition partners. Separately, German prosecutors said on Tuesday that they have widened their investigation into Volkswagen's diesel emissions scandal and are now targeting 11 more employees. Klaus Ziehe from the state prosecutor's office in Brunswick, Lower Saxony, which is leading the German case against VW, said 17 people were now being investigated, up from six previously. "The number of suspects has risen, although none are from the management board," Ziehe said.